For some added traditional style in your bathroom, choose this beautiful vanity. Made with a special white solid wood base and a white marble counter, this piece will make your bathroom look even nicer. Its drawer and roomy double-door cabinet are great to keep bathroom items in. Make your bathroom look like new with this good-looking, useful set from Wyndham Collection. Designed with a modern style and strong build, this vanity is a perfect choice for any bathroom. With a white artificial stone counter and white fiberboard base, this product is good-looking and useful. Put a nice touch on your bathroom's look with this vanity set from Wyndham Collection. The Andover 60-inch vanity with top represents an updated take on traditional design. It features strong, classic lines and decorative carved flourishes, and was crafted with an attention to detail. The white vanity and Carrara white marble countertop are hand-carved and stained. With a width of 72-inch and an elegant design, the Andover bathroom double vanity is ideal for your master or large guest bathroom. It was finished in Carrara white and has decorative carved flourishes. It features a large matching mirror in white for a full bathroom makeover. Quality craftsmanship was used to create this unit, as zero-emissions solid oak hardwood was chosen in an effort to not only reduce environmental impact, but also prevent warping and last for many years. A 12-stage process was also used that included preparing, painting, sanding and hand-finishing. 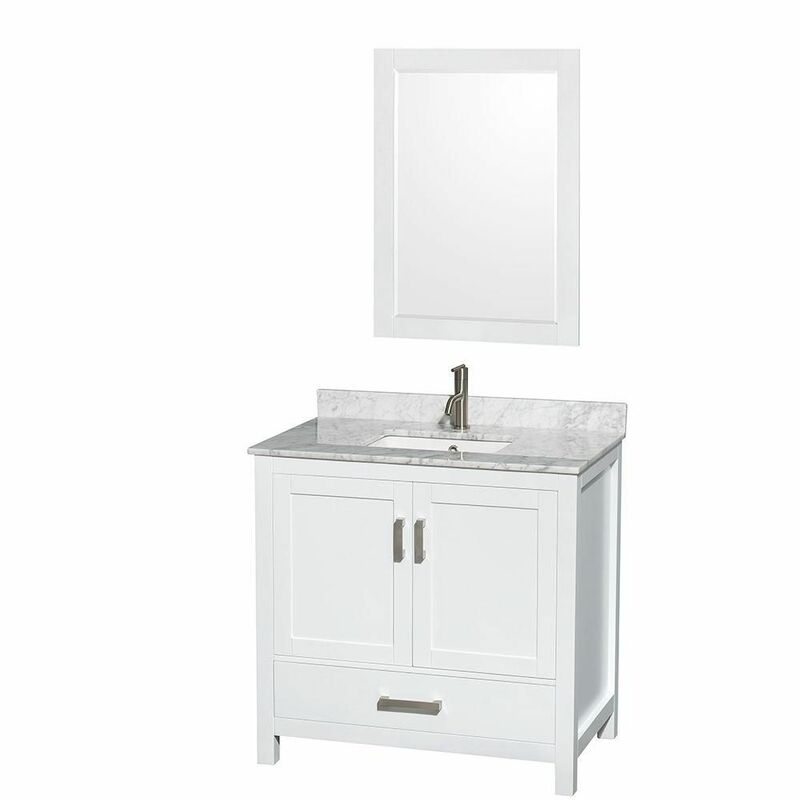 The Berkeley 36-inch Bathroom Vanity with marble vanity top from the Wyndham Collection offers a versatile white finish that will brighten up your decor. Blending a classic look with an air of sophistication and charm, this vanity includes a 3-inch backsplash and will look perfect in any space. Made of solid birch hardwood for long-lasting durability and style, it offers plenty of storage with two doors and five drawers with fully extended, soft-close hinges to house your bathroom essentials. Metal exterior hardware with a brushed chrome finish completes the look. Sheffield 36-inch 1-Drawer 2-Door Freestanding Vanity in White With Marble Top in White With Mirror For some added traditional style in your bathroom, choose this beautiful vanity. Made with a special white solid wood base and a white marble counter, this piece will make your bathroom look even nicer. Its drawer and roomy double-door cabinet are great to keep bathroom items in. Make your bathroom look like new with this good-looking, useful set from Wyndham Collection. Sheffield 36-inch 1-Drawer 2-Door Freestanding Vanity in White With Marble Top in White With Mirror is rated 4.5 out of 5 by 2. Rated 4 out of 5 by Christopher from The box came damaged. I'm working with Wyndham directly to... The box came damaged. I'm working with Wyndham directly to resolve - they have been cooperative so far.The item is as expected. Well built.